Marion Elisberg Simon lives, breathes and loves Chicago. This fabulous, fun, and feisty nonagenarian has called the city her home for nearly a century, and her philanthropic presence can be felt from the South Side all the way to the North Side. From being at the forefront of patient-centered care at Michael Reese Hospital and raising money to ensure the longevity of Chicago's treasured landmark Lincoln Park Zoo to bringing educational opportunities to disadvantaged young people in the public housing project Cabrini-Green and revitalizing the performing arts program at Roosevelt University, as well as its legendary Auditorium Building, Marion has been a force of positive change in Chicago. She has done this all while having a ball - literally. The many noteworthy benefit events in which she's had a hand, featuring Hollywood celebrities as well as Chicago's elite icons, have been as memorable as they've been valuable for the organizations she's served. Marion is a powerful and poised woman who has seen so much and done so much to help others. Her pioneering spirit has left a mark that will surely be felt by many for years to come. 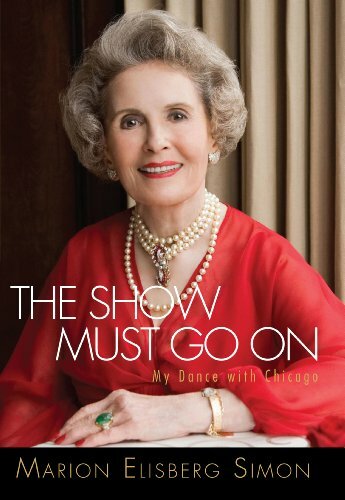 In this, her life story, those who know Marion in her professional life get a rare glimpse into her intimate personal background, at times as heartbreaking as it is captivating and inspiring. Marion has a lifetime of wisdom to share from the lessons learned in her life experiences, the most important being the power of perseverance. Marion Elisberg Simon was born in Chicago in 1918 and has lived in and proudly served the city nearly her entire life. Donating her time and talents to fund-raising for some of the largest institutions in the area, including the Red Cross, Cabrini-Green, Lincoln Park Zoo, Michael Reese Hospital, and Roosevelt University, she has served as an ambassador to their long-lasting legacies, as well as her own. Currently at 94 years old, she continues to be active in the community at large and leads a constantly busy lifestyle. She lives in downtown Chicago with her dog, Lucy. This is her first book.